Solar screen replacement is something that is as common in Phoenix as the purchase of brand new solar sun screens for the very first time. Sun screens in Phoenix have come a long ways in the last 15 years, and the solar screen products are much better than they used to be, however, nothing lasts forever. Phoenix solar screens, despite fabric manufacturer claims to be warranted for lifetime just are not going to look the same as the day they were installed and ten to fifteen years of dust storms, rain, sun, and general wear and tear on your Phoenix solar sun screens. Sun screens replacements in Phoenix are typically cheaper than installing window sun screens for the first time. This reason for this is that the time of installation of the sunscreens is reduced because the hardware is already in place. 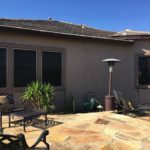 Depending on the quality of the original solar screen product that was installed on your Phoenix home, the option to simply replace the solar screen fabric is often a viable one. Assuming the solar screen frame is of current industry standard of one inch by seven-sixteenths, and has not changed aesthetically in the Phoenix sun, it can save the homeowner money. Especially, if there are a lot of windows. There are times however that it is not suggested to go with the old solar window screen frames. 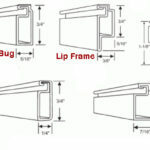 For instance, if the frames are not big or strong enough to hold the heavier solar screen fabrics that are currently being used or the frame corners are plastic or not sturdy. The last thing anyone wants is to spend the money on replacing the fabric on their window screens, and not be happy with the outcome because the frame will not hold the fabric taut. There are also times where the frames may be plenty sturdy to hold the new age fabrics, however the paint has degraded to the point of no return. In this case it is much more cost effective to replace the frames with new solar screen frames and corners than it would be to attempt to re-paint or powder coat the old frames. There has been many times through the past few years where mother nature has decided to take the wheel and show her strength, while taking it out on the Phoenix sunscreens. High winds, hail damage, and other inclimate weather has contributed to the overall window sun screen replacement count in Phoenix. Although in most cases the solar screens are held tight against the window with barrel clips, there are times when they may have gotten just a little loose during window cleaning or just simply could not match up against the micro-bursts that Phoenix witnesses at certain times of the year. In-climate weather and natural disasters like the hail storm back in November of 2010 are a large part of window screen replacements in Phoenix, and are typically not covered by the installers workmanship warranty.